The word apricot to me is just like the word caramel: is it ah-pricots or ay-pricots, is it car-amel or care-amel? I don't know the correct way to say it, but hey, the girl writing is one that to this day still says fuschia funkily and refuses to learn the right way to say it. On another apricot-y moment, apricots are definitely one of those fruits I've never grown up with. My parents would never bring them home, and they'd never really make anything with them. It wasn't until I started to bake continuously that I realized how delicious apricots were, well, when being the star ingredient of a recipe, like this one from Good Housekeeping: Brownies!. I had made a similar recipe before, and honestly, I don't know which is better: these bars or the squares I had recently done (Guess what?? 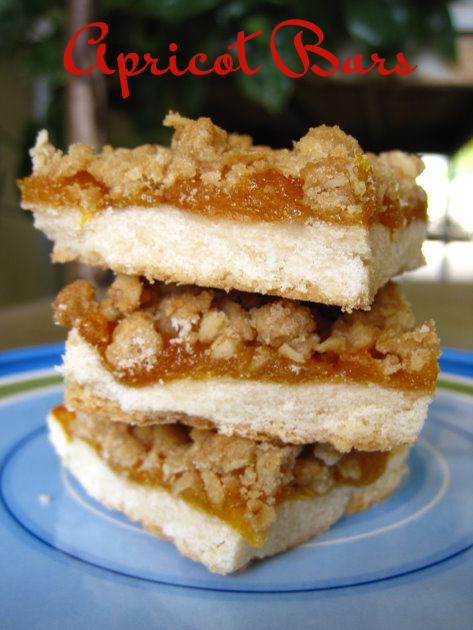 You can now go to my new and still under construction Recipe Index to find the recipe for the Apricot-Almond Squares I'm talking about). These bars are really good, and I especially like the oatmeal crumbly topping. When making these, you should "cool the filling and the crust before assembling the layers to keep the crust from crumbling when you spread the filling over it." 1) Prepare filling: In 1-quart saucepan, combine apricots and water; heat to boiling over medium heat. Reduce heat and simmer, covered, until tender, about 25 minutes. With wooden spoon or potato masher, mash until smooth. Stir in granulated sugar; cool to room temperature. 2) Prepare crust: Preheat oven to 375F. Line 13" by 9" baking pan with foil, extending foil over rim. In large bowl, with mixer at medium speed, beat butter and confectioner's sugar until light and fluffy. Beat in vanilla. Stir in flour until well combined. With hand, pat dough firmly onto bottom of prepared pan. Bake until golden brown and set, about 15 minutes. Cool to room temperature in pan on wire rack. 3) Prepare topping: In medium bowl, stir oats, brown sugar, and flour. With fingertips, mix in butter until mixture resembles coarse crumbs. Spread cooled filling over crust. Scatter topping over filling. 4) Bake until lightly browned, about 25 minutes. Cool completely in pan on wire rack. 5) When cool, lift foil, with pastry, out of pan; peel foil away from sides. Cut lengthwise into 5 strips, then cut each strip crosswise into 8 pieces.